Little-known fact: The late comedian Jackie Gleason was good friends with President Richard Nixon. Even weirder? Both men were obsessed with UFOs. This new book by Larry Holcombe — who’s been studying UFOs for 50 years — does make some wild and thinly substantiated claims. But it’s too fun to pass up. To wit: Gleason’s ex-wife told Esquire magazine that one night, after a day spent golfing, Nixon “showed up at Gleason’s home and whisked him away to Homestead Air Force Base, where they entered a hanger in a high-security area.” There, the two men supposedly gazed upon the wreckage of a UFO and its dead alien cargo. Holcombe, a clear believer, breaks down every rumor about UFO visitation and the government’s “involvement” in it. There are many stories of sightings by high-level people, and it’s no secret that the government has looked into many of these reports over the years. While campaigning for president, Carter promised, “If elected . . . he would disclose what the government knew about the UFO phenomenon,” however, to Holcombe’s knowledge, he never did. 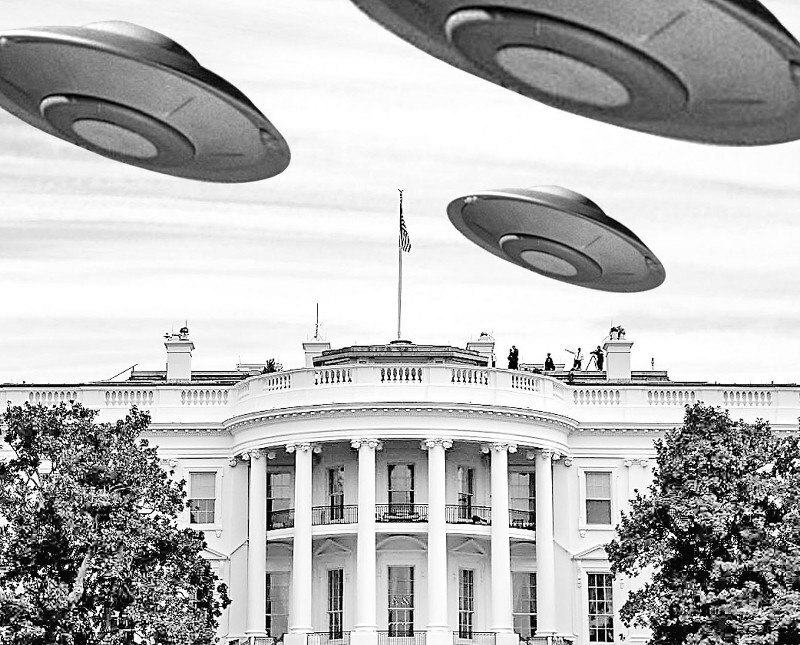 Ronald Reagan is regarded by UFO-logists as “the most open proponent of the existence of UFOs and an extraterrestrial presence as any president in history,” Holcombe writes. The detail about the telepathic alien, alas, was missing from Ball and Allen’s original version. Amazing if true, but Holcombe says the memo’s authenticity is still debated. Just when you think this book can’t get any more bonkers, Holcombe writes that UFOs and aliens may have played a part in the Kennedy assassination. Not to worry: The Obama administration is on it. Appearing on “Jimmy Kimmel Live” last week, Obama was asked if he’d looked into Area 51, which has long been rumored to house the bodies of dead extraterrestrials.